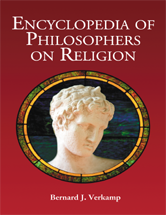 This encyclopedia presents the religious affiliations and beliefs of prominent philosophers, in A-Z entries. Biographical information is given about each with a special focus on his or her religious upbringing, practice, and beliefs (or lack thereof). Each entry also contains a brief summary of the points each philosopher has made concerning God and religion, typically gathered from a study of the philosopher's writings. An examination of several complex issues, including the existence and nature of God, human immortality, and the nature of religious language and symbolism, is thus aided via numerous points of view.